What do you get when you put outstanding performers and ambitious composers together? The Cortona Contemporary Music Festival! Any attempt to describe the 10 day international gathering to produce music never heard before will be understating what it's really like. Live music is experienced real-time but the inspiration from producing and hearing it lasts a long time. I will try to capture some of the conversations and highlights to share with my readers. 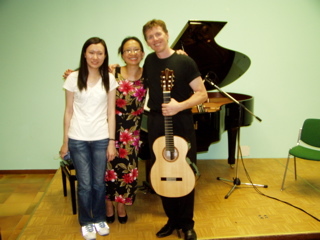 I went to Cortona first in 2006 because my composition for violin and guitar was chosen for premiere. That's the main lure for composers --- to have a say in the way their new works are being played and to hear the live premiere. Finding good performers to play your music is not a given thing. Similarly, not all musicians are eager to premiere new pieces, especially that of living composers who are actually present to bear witness. What can go wrong playing the music of dead composers who can't be critical or playing new music in front of audiences who have never heard of it (in the absence of the live composer)? 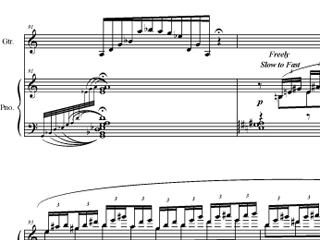 The score is only a medium to communicate what a composer's intention after all. Yet there remains room for interpretation. 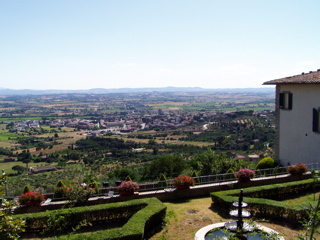 Other than attracting the composers and performers of new music, the magic city of Cortona lures the partners, friends, or families of the participants. 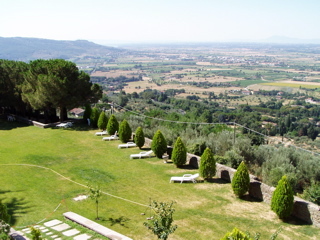 During the day they get to explore Cortona, this ancient city perched on a pedestal. In the evening, they attend the free concerts. The participants, meanwhile, are busy revising their scores or practising or attending workshops and lessons. 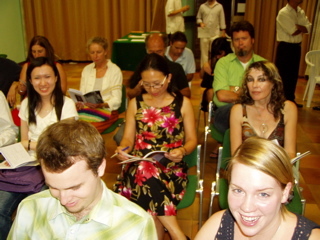 This year I went to the Cortona festival because I was invited to give career workshops for musicians. I've come to the conclusion that successful musicians cannot rely on talent alone. They need to have great interpersonal skills. While I focussed the workshops on networking, portfolio career management, website design, and biography / CV -writing this time, I couldn't help noticing how the interpersonally less-skilled participants were getting marginalised or left behind. Opportunities and referrals occur in real-time, not on magic bulletin-boards. You are more easily forgiven for bad music if you are likeable and liked. If people don't dislike you or find you annoying or arrogant, they will give you constructive feedback. If not, you risk being misunderstood and ignored. It's a misconception that composers only get paid through commissions, like the way you pay a chef for every dish he makes. 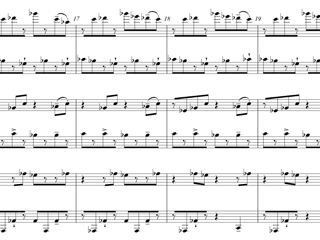 For this and other reasons, musicians don't ask (commission) composers to write for them. One composer I spoke to simply wanted her works performed. If they are performed, her publisher will publish and distribute her music. Getting her music recorded is a bonus. She seems to have a time line beyond her lifetime. Indeed, we are still enjoying the legacy of composers from a previous era. When I asked another composer to write a piece without payment, he replied,"I thought you'd never ask. I have a full-time salary so I don't need to be paid." There are composers who write for free for those musicians who have active performance schedules. In a sense, the performers are their messengers. This year, I no longer talked about money but openly invited those composers whose works I liked to write for my piano guitar duo. Their works would be heard throughout the Netherlands and anywhere else my duo tours. Their pictures and biographies will also be highlighted on our website. It's the opportunity to be heard and recognised that drives many aspiring composers. There are those cautious composers who simply want a safe place to learn, like I was last year. Where else will professional musicians work with you, tell you what's wrong and how to improve a piece? In addition to giving workshops and individual career consultations, I also participated as a pianist this year. Without the daily chores of cooking, cleaning, and maintaining an existence in my usual surroundings, I was able to focus on studying the two piano guitar duo pieces. If only I had brought my manuscript paper, I would have joined the composers in the "lab" where four Roland electric keyboards with headphones were set up. I had such a guilty conscience for a missed opportunity. Besides the serious work of preparing for a concert, I found the time to take siesta in the blue and white hammocks hanging on the pine trees overlooking the village of Camucia below. There's an eerie calm that descends as the heat rises in the afternoon. After lunch on the terrace, there's only one thing more delicious: a nap. Sleep, the sun persuades. Sleep, the window shutters close. Sleep, your eyelids beg. As I dose off in the heat of the day, pine needles and pine cones would fall and join me in my hammock, swaying to the gentle breeze. On the last Friday, news of the possible train cancellation on Sunday brought worry and panic among the participants. It was a train ride to Florence and Rome where some had flights to catch for Moscow, Hong Kong, and other international airports. In some ways, this concern unified the group. Everyone had to work out a solution together, be it sharing a cab early in the morning or catching a lift with someone. I opted to stay an extra day to see Cortona. And that was a good decision. On Saturday we went to a free midnight pool party at the top of the hill. I heard Hotel California: you can enter anytime you like, but you can only leave after purchasing a drink --- any drink for 8 euros, thereafter the regular prices. As it was swarmed with men, the bartender deliberately made strong cocktails for the ladies. My mojito was more like a lot of rum with a splash of tonic while the guys drank beer from bottles. Like I said, anything I write will be understating how it truly felt to be part of this new festival. While photos and music might trigger memories, some things are better left in the corners of my mind. Portfolio careerist Anne Ku participated as a performer, composer, and workshop lecturer at the Cortona Contemporary Music Festival. She writes reviews about events and experiences worth remembering. This is her first review of a summer music festival.